This newly renovated and furnished condo consists of a master queen-sized bedroom, living room/dining room, full kitchen, bath, and second bedroom or office. 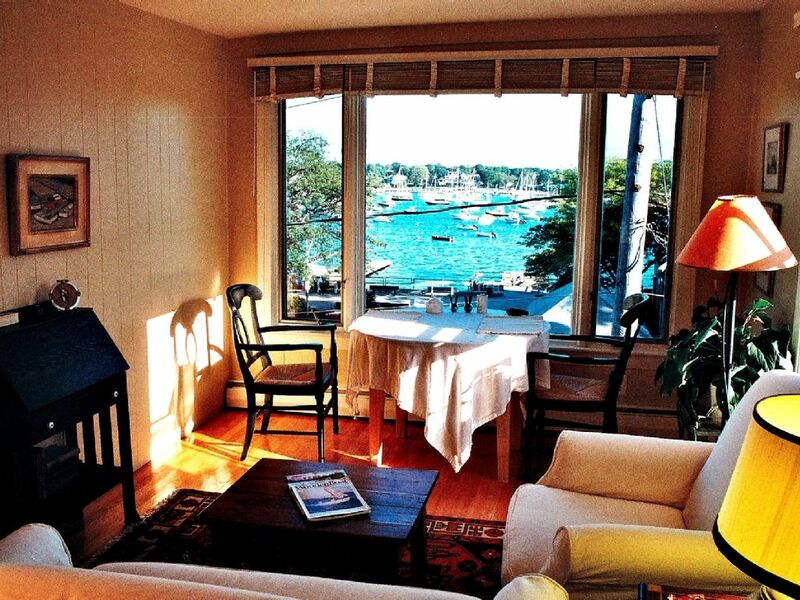 The master bedroom and living room/dining room face directly Marblehead Harbor. Enjoy the view from your pillow of the yacht-filled harbor. Dine while watching the lobster boats unloading their catch at the public wharfs. Unit has access via its own internal stairway to a roof deck offering panoramic harbor views. Visit the antique and many specialty shops just steps away. Stroll through Old Burial Hill, Fort Sewell, Crocker Park, or pay a visit to Abbot Hall to see the famous 'Spirit of 76' painting. For those who enjoy sailing, there is direct public access to the harbor at the Clark Landing directly in front of the unit. In season, a steady stream of Yacht club launches (Marblehead boasts 6 yacht clubs), tourist cruise boats, kayaks, and yacht tenders can be viewed from your living room. Dining table near picture window overlooking harbor. Private stairway inside unit to roof deck with panoramic views of harbor. Loved everything about this condo—great location and views, tasteful furniture and art, good bedding, good books and gracious hosts. Would definitely come again! Phil's place for perfect for two busy parents to suspend time for 12 hours and be off the clock. We immediately relaxed and the view, the sunrise, and streaming sun was a real treat. Also thanks for the fridge goodies! Phil was responsive to any requests we had, thanks. Great location, clean, very pleasant. The stairs may be a challenge for some but we liked the exercise. Otherwise everything was clean and really nice decor. Wonderful view. Traditional style inside and out, fantastic location. This apartment is located in a quiet neighbourhood with plenty of amenities within walking distance. Breakfast, lunch and dinner are on your doorstep, a well stocked supermarket is less than 5 minutes walk. View's are spectacular. The only downside would be if you have mobility issues as it's two flights of narrow stairs. Salem is a 10 minute drive away but if you want a relaxing stay then Marblehead has all you could want. Contact with Phil has been good throughout our booking and was happy to answer all queries before and during our stay. If we're ever going to be in this area again I would not hesitate to come back here or recommend to friends travelling to the area. Driftwood for breakfast at least once is a must. This is a perfect spot. Great location, great view, and easy to get into. $50 Cleaning fee applicable for stays of 7 nights or more. One night stays are considered at a rate of $200 a night.